Author: Kathrin Tiewa. Series edited by: Thomas Bierschenk, Heike Drotbohm, Raimund Kastenholz, Matthias Krings, Carola Lentz, Anja Oed. The year 2010 was an important year for the African continent. Fifty years of independence were commemorated in seventeen mainly francophone countries. The first of these countries to celebrate its jubilee was the Republic of Cameroon. The jubilee celebrations, and the more frequently occurring national days, which usually commemorate the declaration of independence in Africa, offer, for the researcher, an oppor­tunity to observe contested processes of nation-building. At the same time, they constitute an integral part of nation-building by performing and representing the nation. Was 20th May 2010, National Day, the climax of festivities celebrating independence, reunification or rather unity? Were the celebrations able to foster a sense of national consciousness and thus enhance the project of nation-building? And if yes, how was this consciousness evoked? The assumptions underlying this book were formed around these questions, suggesting that in spite of diverging opinions about the aim of the celebrations, i.e. what exactly was being celebrated, the government was able to manipulate festivities for its own benefit in view of the impending presidential elections in 2011. This book is divided into three main chapters. 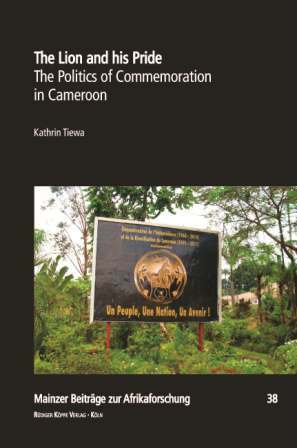 After an introduction, chapter two describes the historical challenges which face Cameroon, and traces the origin of some of the problems the country is confronted with today, particularly concerning the Anglophone question. In chapter three, the author examine the official memories which dominated the festivities, and the politicization of the celebrations. First, it is shown what symbols, monuments and artifacts were used in order to stage the theme of the celebrations, unity, before the impact of this symbolism and its political context is critically analysed. In the following sections, political rhetoric which accompanied the festivities is discussed, by analysing the structure of discourse of some of Biya’s speeches by the method of word counting, and by detecting the foci of the speeches which were held during the jubilee period. The last section of the chapter concerned with mem­ory dwells on organized oblivion. Chapter four presents the events on the occasion of the Golden Jubilees in 2010 and 2011, and is based on empirical data and newspaper analysis. An appendix gives an account on speeches, decrees and further texts on the organization of the anniversary celebrations.